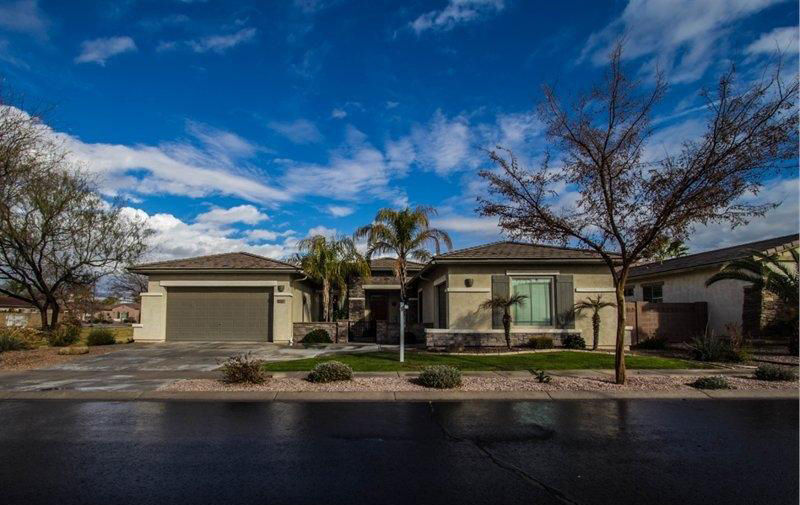 Beautiful single level home in Chandler’s gated lake community of Lagos Vistoso. 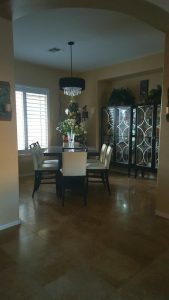 This home has curbside appeal with gated courtyard, lots of upgrades including travertine tile throughout. Formal dining room and family room with entertainment niche and stone faced fireplace that opens to the Gourmet center prep island kitchen with dark cabinets, pull out shelves, double ovens, Corian counters, breakfast bar, and brick accented stove. There’s 4 large bedrooms & 3 full bathrooms that includes a separate guest suite. Master retreat features upgraded bathroom with a ceiling to floor tile in the walk in shower, dual sinks, and spa-like soaking tub. Large laundry room with cabinets and utility sink. Extended length 2 car garage with service door and cabinets and 3rd additional garage on other side of home. Tropical landscaped yard features luxurious pool and spa with color changing Malibu LED lights, extended pergola with roof that opens and closes by remote control, paver patio, built-in BBQ. Large corner lot siding to the greenbelt with no two story homes behind it. 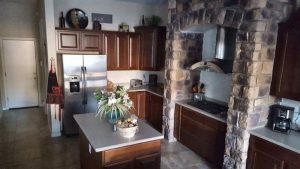 Amazing community with 16 lakes, acres of parks and walking trails, shaded tot lots, basketball court, armadas, and BBQ’s.